The crazy thing about how far behind my reviews have fallen isn’t that the backlog is huge, but that it’s so very, very small. There’s the movie I saw before this, which I have finally accepted won’t be served by a useless review and which will therefore have to wait until dollar theaters pick it up so I can purge expiate my sins, there’s this one, and there’s one book I finished almost at the same time. Nothing else. I haven’t exactly been avoiding the theater? I have most definitely been avoiding books though. Which is to say, boy howdy have I read a ton of comics over the past month. 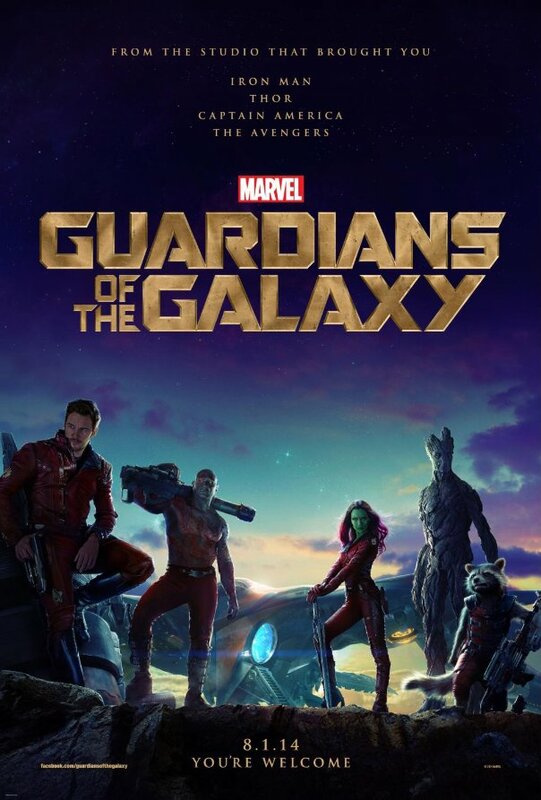 None of that has anything to do with anything, except oh wait, it totally does, since I just remembered that the movie I am reviewing is Guardians of the Galaxy. If you were to guess I had seen that comic in the mid ’70s, the answer would be, sort of? I did, but just the premiere issue so far, and it has nothing whatsoever to do with the characters that populate this movie. I did read a handful of issues of Adam Warlock which introduce Gamora, making her, so far as I can tell, the oldest of these characters in Marveldom. This is not only pretty cool, but it definitely puts a pleasantly ironic spin on a situation I read about a few weeks ago where someone was selling kidshirts of the characters and left her off because she wouldn’t appeal to boys enough. That’s already dumb on the face of it, obviously, but man oh man is it five times as dumb with the added knowledge about their collective history in comics. None of which has anything to do with how good the movie is, I know, but… it’s been out more than a month. I kind of missed the boat on that one already, y’know? But let’s pretend I haven’t, and someone who can see this hasn’t actually seen the movie yet. It’s like this. A misfit kid with the soundtrack of the ’70s and ’80s as his sole possession in life winds up in space because that’s how comics work sometimes, only now he’s a cool thief. Then he gets caught up in a galactic civil war between the Kree and some other people who are not the Skrulls and who I would probably know more about if I had read comics from the ’80s, meets up with the daughter of the baddest dude in the galaxy, not to mention a psychotic raccoon, his pet tree who has a lot to say but only the raccoon can translate, and an angry tattooed giant out for revenge because the second baddest dude in the galaxy killed his entire family one time. Then, they… well, the point is, literally any damn thing could happen, and if you aren’t desperate to know what, we are entirely different people, you and I. Not the Danny Ocean kind of thief, the Indiana Jones kind, if Indy had ever acknowledged that he’s totally a thief but for museums, which by the way is 100% what he is. I mean, it’s not his fault, it is colonialism’s fault, but think about it. It’s more complicated than that, but at some point I’m just writing a spoiler-filled summary of the movie instead of a review; plus also, if I break it down, the movie sounds less like Star Wars. Who we last saw financing the destruction of the earth for unknown reasons. “For you, the day Bison graced your village with his presence was the single most important moment of your life. For me, it was a Tuesday.” Oh Raul Julia, we miss you still. This entry was posted in Film and tagged 3D, action, IMAX, Marvel, superheroes on September 4, 2014 by Chris.